Background: Econazole, sulconazole and tioconazole usage as antifungal agents is limited due to poor pharmacokinetic properties. Pristine and hydroxylated structures of the C240 fullerene and single walled carbon nanotube (SWCNT) were proposed as transporters of these imidazoles potentially enhancing their pharmacokinetics. Methods: To assess possibility of creation of the endohedral complexes of the azoles and carbon nanostructures, their adsorption and interaction energies were calculated with the hybrid exchange-correlation density functional B97-1 and 6-31(d,p) basis set. Interactions within the transporter - drug complexes were investigated with the Atoms in Molecules (AIM) Theory and Reduced Density Gradient (RDG). 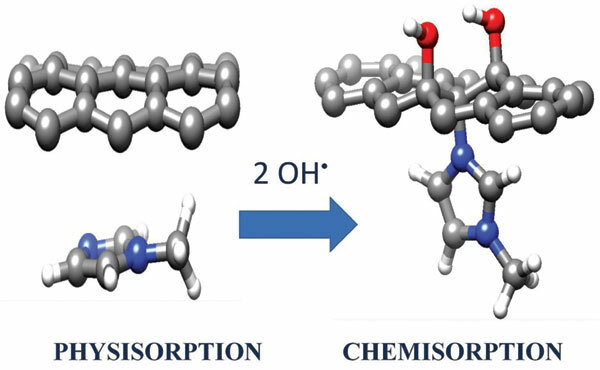 Results and Conclusions: The adsorption energies of the studied azoles depend on type and surface modification of the transporter. Hydroxylation of the fullerene and nanotube surface makes an opportunity for chemisorption of the investigated antifungal drugs. The pristine and hydroxylated nanotube complexes exhibit thermodynamic stability. The complexes of the fullerenes are thermodynamically unstable but its kinetic stability could be significant thus allowing for the such structures to exist. The energetic instability would enhance liberation of the encapsulated molecule from the complex. It is advantageous in the context of drug release. Keywords: Endohedral complexes, thermodynamic stability, kinetic stability, intermolecular interactions, imidazoles, reduced density gradient, atoms in molecules. Keywords:Endohedral complexes, thermodynamic stability, kinetic stability, intermolecular interactions, imidazoles, reduced density gradient, atoms in molecules. Abstract:Background: Econazole, sulconazole and tioconazole usage as antifungal agents is limited due to poor pharmacokinetic properties. Pristine and hydroxylated structures of the C240 fullerene and single walled carbon nanotube (SWCNT) were proposed as transporters of these imidazoles potentially enhancing their pharmacokinetics.